Huawei announced a new Honor 7i device in China. The Device looks nice, the button placement - Home and Volume rocker are placed in one side which helps for better navigation and usage. Looking at the image you can pretty much tell that, the power button is placed in the right placewhich is easy to reach, it is also finger print sensor on the side of the phone which Huawei claims to be the smallest fingerprint sensor. Beneath the volume rocker and home button you see SIM card slot is placed. 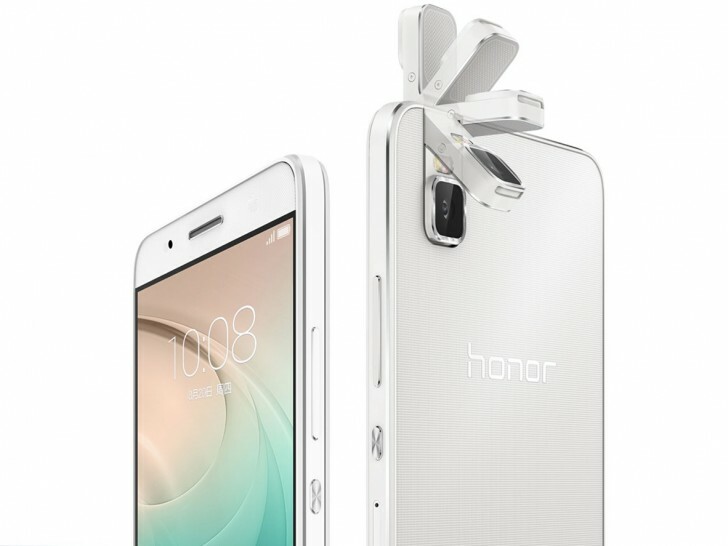 You would have also searched for one thing in the phone, there is no front camera in the device, but the Huawei Honor 7i has a rotating camera which is placed default in as a back camera and can be rotated for front camera usage. Huawei Honor 7i has a 5,2-inch 1080p Display with 423 PPI. It is powered by Octa-core Snapdragon 616 processor. It packs 32GB internal memory storage with 3GB of RAM and a 16GB storage with 2GB of RAM and expandable memory. It features 13MP camera. It packs 3,000mAh battery. We would update you with the price soon. Till that Keep visiting, Stay updated.